Atlases is a self-proclaimed modern post-metal band hailing from Pori, Finland, which was founded in 2017 by Oceanwake-guitarist/vocalist Ville-Veiko Laaksonen. The new material Ville-Veiko had written for Oceanwake turned into a project and not much later Atlases was born, resulting in Ville-Veiko’s departure from Oceanwake. Now, not much later, Atlases is a full-blown band with a line-up of five, consisting of Jamppa Lamminpää as vocalist, Nico Brander on guitar, Jerkka Perälä on bass, Rami Peltola on drums and of course Ville-Veikko Laaksonen on guitar. Although it is commonly accepted that patience is a virtue, the guys either disagree with this or don’t care, because before a year has passed they have released their first work, an EP called Penumbra. Considering the somewhat vague story of the birth of Atlases one would expect the music to be largely different from Oceanwake’s music, but the opposite is true. Music-wise the two bands are not far apart at all, making me wonder why Ville-Veiko decided to start with Atlases. Anyway, as interesting a story that could be, this review is not about the emergence of Atlases but about their music, so I better get to that. They are not much of a help here, because the EP takes off with An Era We’ll Bury, which of course might very well be an innocent coincidence, but still is a striking title. All this is quickly set aside though, when the song starts, immediately shifting my focus to the tunes which, as turns out after hearing the entire release, are a perfect example of what Atlases stands for music-wise. The post-metal influences are obvious, yet the term doesn’t quite cover it. The clever use of soundscapes adds a subtle, yet unmistakable atmosphere of melancholy in the music, giving it a somewhat mysterious, ominous feel without sounding too desolate. The lingering, at times double, two-toned grunts augment this feeling, moving Atlases’ music to a darker corner of the post-metal genre. There’s no thumping riffs, no screaming solos, no thundering rhythm section. No, what Atlases presents is atmospheric, thoughtful, almost cautious metal music, which is remarkably relaxing despite the earlier mentioned ominousness. To me, due to various reasons, the second song of any release is an important factor when it comes to judging path and quality of said release. On Penumbra this rather ungrateful task falls to A Passage Through Nebula and right from the bat it’s clear that Atlases continues where they had left off with An Era We’ll Bury. A Passage Through Nebula also offers a very determinative atmospheric aspect, perhaps even more so due to the use of clean vocals next to the grunts and the more distinct use of soundscapes that are woven around the alternately relaxed and raw rhythm. Hamartia, even though more or less the resting point of this release, is built around the same concept, in fact all songs more or less are. Despite them starting relatively calm, sometimes even serene, every single song eventually ignites into a more unpolished, less smooth rhythm, only to fade back into the peace and calm from earlier. This may sound as a recipe for monotony, but that is definitely not the case here. The guys have put enough variety, fire and heaviness in both rhythm and song structure to avoid that pitfall. Try Shards Of Broken Light, the most heavy piece on Penumbra, for size. Needless to say the term ‘heavy’ must be seen within perspective of course, you have to keep in mind you are listening to a post metal oriented band. 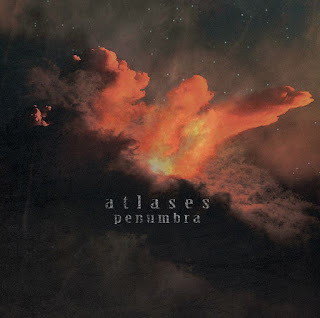 Having heard Penumbra I must say Atlases, despite being a new band, already seems to have found the style of music that fits them like the proverbial glove. The dark, melancholic atmosphere they have added to their solid and varied post-metal gives their music an elusive touch that is both intriguing and compelling. The composition and structure of the songs, the execution of the various instrument- and vocal lines, it all comes together. In addition Ville-Veiko managed to sweep some quality musicians together who seem to understand each other completely, one could be forgiven for assuming this is a band that has been around for quite some time. For all to enjoy, especially if you’re into atmospheric metal music. Make yourself comfortable, put this release on and you’ll enjoy a great thirty minutes with this musical experience. Time well spent.